Trail 142 mm / 5.6 in. Dimensions Length: 2747 mm / 108.1 in. The new long distance machine others will be chasing for years. The new long distance machine others will be chasing for years with the world's largest storage capacity with over 41 gallons. Choose the Cross bikes for traditional styling with the modern technology only Victory brings to riding enthusiasts. It starts with the 106 cu. in Freedom V-Twin with power and torque for exhilarating speed at the twist of the wrist. With a 6-speed overdrive transmission these bikes have the long legs for all-day cruising. Our all-aluminum backbone frame provides light low-speed handling and impressive stability in corners and at speed. Combined with a range of windshields and storage choices and you have a bagger for everyone who wants to travel in style and comfort. Touring riders can put away their tools. The new Lock & Ride® Trunk from Pure Victory can be installed on a Cross Country or Cross Roads in seconds, and removed just as quickly - without tools. To install a trunk, a rider simply aligns the trunk mounting legs with mounting points at the rear of the bike and snaps down the locking arm. The trunk's power cord connects easily to the bike's electrical system to power the taillight at the rear of the trunk lid, the audio speakers and the accessory power outlet inside the trunk. To remove the trunk, simply reverse the process. When the trunk is on the bike, a locking pin can be added for theft prevention and additional peace of mind. oThe trunk has more than enough room for two full-face helmets. oThe trunk lid seals securely, is lockable and provides the bike with a high-mounted taillight. o The front face of the trunk has a comfortable, padded passenger backrest and dual audio speakers. o Each 2011 Cross Country and Cross Roads comes with a spare lock cylinder so a trunk can be locked with the bike's ignition key. Victory has a track record of consistently outstanding reliability and dependability, which has led to the industry's highest customer satisfaction ratings. This proven reliability, along with the new transmission design, allows Victory to recommend extended oil service intervals for 2011 drivetrains. oThe recommended oil change interval for 2011 models is every 5,000 miles (8,000 km). oLess-frequent oil changes results in a lower cost of ownership. The Victory drivetrain team scrutinized every component of the engine and transmission and fine-tuned the designs and performance of numerous parts. Approximately 40% of the drivetrain is new for 2011, with the transmission receiving so many improvements it is virtually a new transmission. The changes: improved manufacturing efficiency and quality assurance; enhanced drivetrain's already-impressive reliability; improved engine performance; and, for riders, improved ridability and delivered a more appealing-sounding transmission. oIn terms of operating sound, selected modulation frequencies have been eliminated. This produces a more-appealing sound - consistently in each gear. In 4th and 6th gears in particular, gear whine has been reduced. oDriveline lash has been reduced by 66%. o"Neutral Assist" has been added to make it easier for a rider to shift into neutral when stopped. This will reduce the rider's effort, will reduce clutch wear and will lessen the performance demands on the oil. o An analog speedometer, which may be set to show MPH or KPH. oA large LCD that displays: Clock (time of day is viewable at all times), gear position, tachometer and diagnostic readouts for Victory dealership service technicians. o The gauge face includes lights such as high-beam and neutral indicators and the oil warning light. Cruisers no longer have these indicator lights atop the triple clamps. oThe Cross Roads instrumentation also has an always-viewable fuel gauge. All brake calipers, rotors, lower belt guards, and floorboards are black. oAll left- and right-hand switch cubes are black, as are the audio control switch block and cruise control switch block. o The triple clamp is black on all models except the Vegas Jackpot (which retains its chrome triple), and the Victory Cross Roads (which retains its brushed finish). o A new side stand on each model features an integrated hooked-end design for easy locating and easy control of the side stand. o All cruiser exhausts have a larger outlet for improved sound quality and a lower exhaust note. 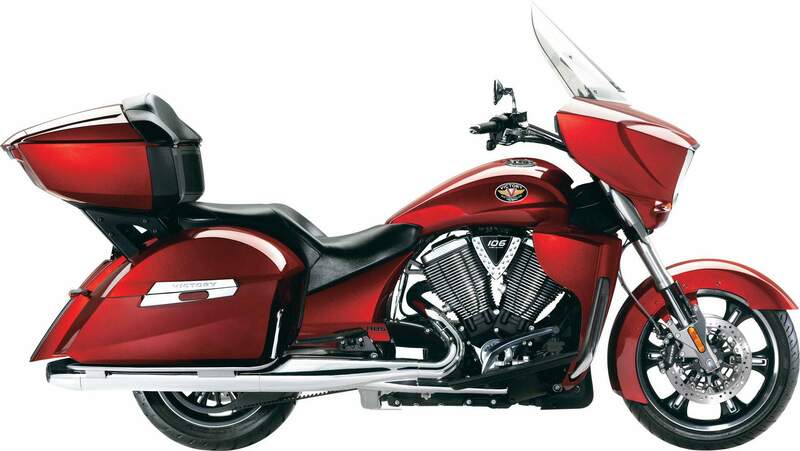 The Victory Cross Roads is an extremely smooth, powerful and comfortable touring model. Multiple options allow the rider to tailor this motorcycle for any type of touring. o Strong, innovative two-piece, sand-cast hollow aluminum frame. o Air-adjust rear suspension with 4.7 inches/120 mm of rear travel. o Dual disk front brakes and inverted forks. o Instrumentation includes analog speedometer, fuel gauge, odometer, trip meter, and indicator lights. o Ultra-bright, multiple-LED turn signals and flush-mounted taillight. o New Lock & Ride® Trunk available as a Pure Victory accessory. o Trunk can be installed or removed in seconds - without tools: Align its mounts, lock it in place, connect power cord and ride. o Spacious trunk can hold two full-face helmets and have room to spare. o Trunk features comfortable passenger backrest and two audio speakers. o Trunk lid seals tight, is lockable and provides bike with a high-mounted taillight. o Available trunk accessories: Passenger Armrest Kit, Trunk Cargo Rack, Trunk Liner. o Lock & Ride® Trunk, Trunk Cargo Rack, Trunk Liner, Passenger Armrest Kit, and Chrome Saddlebag Protectors. At the heart of the Cross Country Tour sits the Freedom V-Twin power plant, expertly balanced for the perfectly controlled explosions that deliver 97 horsepower and 113 ft lbs of hole shot torque. Maestro of the motorcycle world, it's what keeps man, machine and highway working together in perfect harmony. The highest performing transmission on the road receives the power generated by the massive V-twin and seamlessly turns it into something you can use. Neutral Selection Assist and helical-cut gears ensure every shift is as quiet and smooth as the one before it. 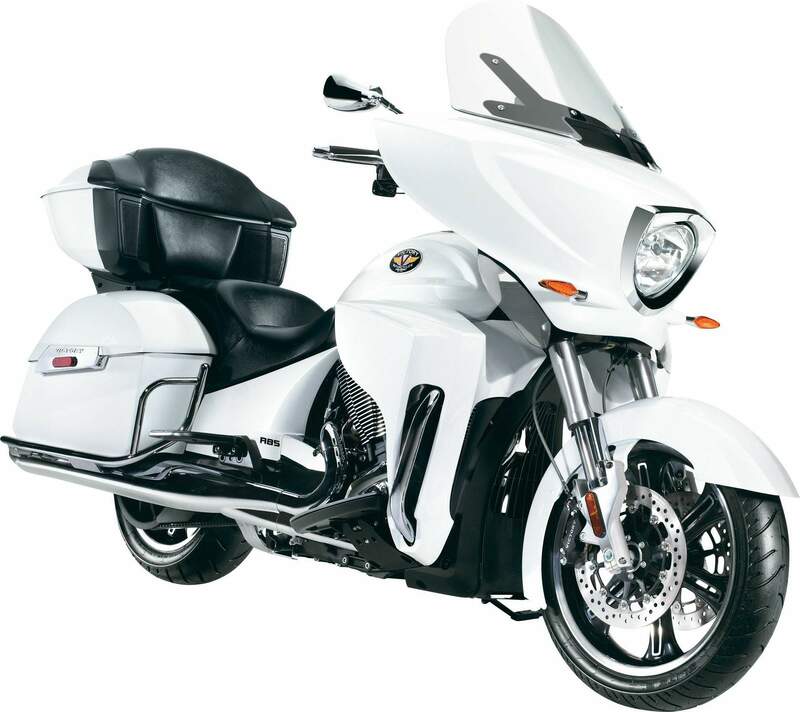 Standard on the Cross Country Tour, the Victory Anti-Lock Brake System doesn't discriminate between dry, wet or rock-strewn pavement. No matter what the conditions, ABS monitors what the wheel is doing and gives you consistent, smooth braking from the handlebar lever down to the rubber on the road. Since Mother Nature seldom listens to the weather requests of motorcycle enthusiasts, we've taken means to accommodate her. Down below the knees, we've given the Cross Country Tour dual fairing vents (as well as a storage box). Close 'em for complete protection in cold or rain, open 'em wide when the weather's more agreeable. After making every other aspect of going the distance as effortless as possible, the throttle hand still had a beef about being overworked. By adding precise, automotive-style cruise control, the right mitt can now simply hang on and enjoy the ride. Just in case the open road gets too lonely the class-leading rear suspension features an easily adjusted air shock and coil spring, ensuring a smooth ride for you and any adventure seeking passenger. 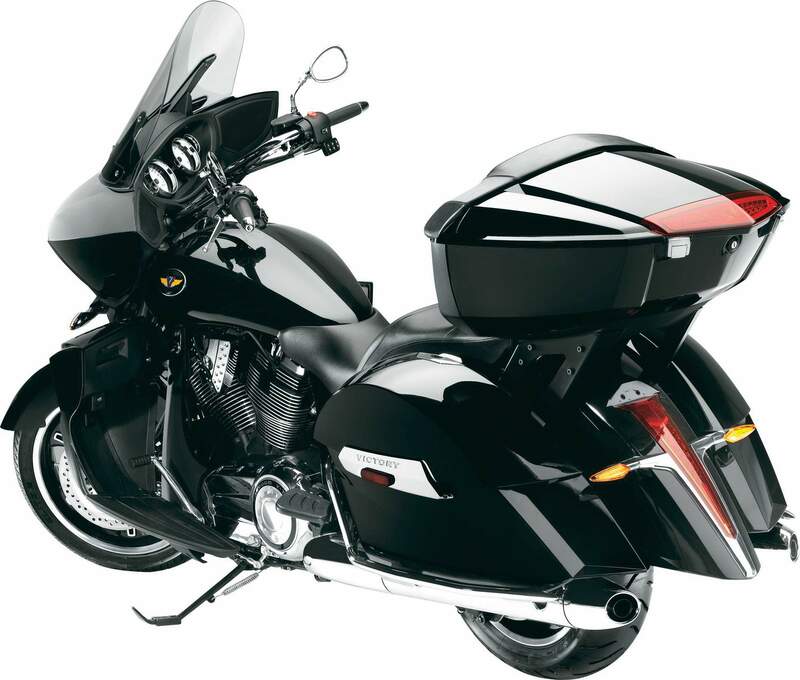 Add up lower faring space, trunk and saddlebags and you get an amazing, best-in-class 41.1 gallons of storage space. With lockable latches and 21.3-gallon capacity, the Cross Country Tour can protect from theft and accomodate a passenger that doesn't follow the "travel lightly" rule. Exquisitely designed chrome rails provide style as well as tip-over insurance that you'll be grateful for when your brother-in-law asks to ride. The Cross Country Tour lacks for nothing in the comfort category, and as proof we offer up heated seats and handgrips as exhibit A. Together they offer the best means of enhancing your road warrior reputation by adding precious road time to both sides of summer. To maximize comfort, we've raised the windshield, resulting in reduced buffeting and increased wind and rain protection. Rule of the road: the lower the seat height, the more control. The Cross Country Tour has the lowest seat in its class. Unless you admit having the toe strength of a ballerina, you want to be able to plant both feet firmly on the ground. A machine that looks this good deserves to be seen. The High Intensity Discharge headlamp shines four times brighter than standard halogen headlamps and shouts 'HERE I COME' four times louder. Since it also lasts 10 times longer, you can see your way ocean to ocean with every mile marker perfectly illuminated. When the passenger floorboards are easily adjustable, any height passenger can find comfort. That's the long and short of it. Power from the engine can now be sipped to charge phones, cameras, or anything that uses a 12v socket. Sometime during your long distance cruise you may need to call in support for that rider stranded with a lesser motorcycle.